flooding and cave-ins, and revolutionized the oil industry. Edwin Drake was born in 1819. He was born in Castleton Corners, Vermont. His father was a farmer. Edwin went to school. He helped on the farm. He left home when he was 19. Edwin married a lady named Philena. They had a son named George. Edwin did lots of different jobs. In 1849 he got a new job. He became a train conductor. He worked for the New York & New Haven Railroad. In 1854 Philena died. In 1857 Edwin became sick. He had to leave his job. He moved to New Haven, Connecticut. Edwin met an interesting man. His name was James Townsend. Mr. Townsend had started a company. It was called the Seneca Oil Company. He wanted to get oil from the ground in Titusville, Pennsylvania. People used oil lamps to light their homes. They filled them with whale oil. The oil came from sperm whales. Too many sperm whales were killed. They became scarce. Whale oil began to cost too much. The Native Americans had known about oil in the ground for years. They called it “antonotons.” This means “Oh, how much there is!” They used it on cuts and sprains. It was good for lubricating wheels. The smell of oil kept flies away. The settlers called this oil Seneca Oil. Some people tried to use Seneca Oil in their lamps. It did not work well. It burned with a black smoke. It smelled bad. Then a man discovered a way to process the oil. He could get out the impurities. Then the oil would work in oil lamps. James Townsend knew about this. He had bought some land in Titusville. He wanted to get oil out of the ground. He would process it, and sell it. He hoped it would make him rich. Edwin was interested in Seneca Oil. He bought some stock in the business. James Townsend needed someone to go to Titusville. He needed someone to inspect his land. Edwin needed a job. He also had a free train pass. James Townsend hired Edwin. He sent him to Titusville. Edwin traveled to Titusville in December 1857. He saw pits dug in the ground. The oil seeped into the pits. There was plenty of oil there. He sent a report to Mr. Townsend. Mr. Townsend was pleased. He gave Edwin a full-time job. Edwin became the General Agent for the company. His salary was $1000.00 per year. Edwin married Laura Dowd in 1857. The couple moved to Titusville. When Mr. Townsend wrote letters to Edwin, he addressed them to Colonel Drake. Edwin wasn’t really a colonel. It just sounded good. The Seneca Oil Company wanted to impress people. Edwin wasn’t sure how to get the oil out of the ground. Using pits was too slow. He thought he should dig a well. He hired a crew. They dug a well. It flooded with water. Digging didn’t work. Edwin decided to learn how to drill a well. Edwin traveled to a town called Tarentum. In Tarentum they drilled for salt water. When the water dried up, the salt was left. People sold the salt. Edwin watched the drillers. He learned how to drill a well. He bought the equipment he needed. He bought drills and a windlass. He bought a steam engine to drive the drill. He hired a well driller. Then he went back to Titusville. The well driller never came. Edwin hired a second man. He did not come either. By this time it was winter. The ground was frozen. Edwin would have to wait for spring. Edwin kept looking for a driller. He met a man named William A. Smith. His nickname was “Uncle Billy.” Uncle Billy had drilled many wells. He agreed to work for Edwin. He would earn $2.50 per day. Uncle Billy brought his son along. His son was named Sam. Sam was 16 years old. Sam worked for free. In the spring, the men started work. They drilled a well. It filled with water. This happened many times. Flooded wells were no good. Edwin kept on trying. He was running out of money. Then Edwin had an idea. He bought some pipe sections. They were made of cast iron. Each one was 10 feet long. Edwin and Uncle Billy joined the pipe sections together. They made a very long pipe. They drove the pipe into the ground. They used a battering ram made of oak. They drove the pipe 32 feet into the ground. Now the water could not get in. They drilled inside the pipe. People called Edwin’s well “Drake’s Folly.” Folly means foolishness. They thought that he would not succeed. The Seneca Oil Company did not believe in him either. They did not send much money. Then they stopped sending money altogether. They told Edwin to give up and go home. Edwin kept trying. When he ran out of company money, he used his own money. By August he had almost no money left. Two businessmen helped him. They took him to the bank. They guaranteed a loan for $500.00 for him. This meant that if Edwin could not pay the loan back, they would. Now Edwin had money to keep working, as well as food to feed his family. By now he and Laura had two more children, named Alfred and Charles. One Saturday, Edwin and Uncle Billy were drilling. The date was August 27, 1859. They had drilled down 69 feet. Suddenly the drill dropped six inches all at once. This had never happened before. They wondered what it meant. Edwin and Uncle Billy decided to stop for the day. On Sunday afternoon, Uncle Billy and Sam visited the well. They looked into the shaft. Uncle Billy made a cup out of some spouting. He dipped it into the liquid in the shaft. It was oil. The well was a success. They were very excited. The well produced about 10 barrels of oil every day. This was a lot of oil. They borrowed a hand pump. They pumped the oil into a washtub and some whiskey barrels. Edwin drilled another well. This one produced 24 barrels of oil every day. Edwin had done a good job. The Seneca Oil Company was very pleased. But they did not hurry to pay Edwin. He had to wait. They did not pay him until 1864. Edwin did not have much money. He could not afford to buy any land for himself. If he had owned land, he could have drilled his own well. He could have earned some money that way. Edwin also passed up a good chance. He had invented the pipe that went around the drilling area. It was called a drive pipe. Edwin should have gotten a patent on his invention. Then everyone who used it would have had to pay him. But Edwin did not bother. It is interesting to know that oil wells are still drilled today using Edwin’s drive pipe. Edwin worked for a little while. He worked as a Justice of the Peace. He did not make much money that way. The family left Titusville in 1862. Edwin had a little money left. He lost it in bad investments. Now the family had no money. Edwin was too sick to work. Edwin’s wife Laura found ways to earn money. She rented some of the rooms in their home to people who needed a place to stay. Laura also did sewing jobs for money. In 1865 Laura had a baby girl. They named her Mary Laura. The people in Titusville heard how poor the Drakes were. They thought that this was not fair. Edwin had invented a way to get oil out of the ground. He had helped the economy of Pennsylvania. They felt that the state should help Edwin. The town sent a letter to the Pennsylvania General Assembly. They asked for a pension for Edwin. The General Assembly said yes. They agreed to pay Edwin a pension of $1500.00 per year. If Edwin died before Laura, she would get the pension until her death. This was very good news for the Drake family. 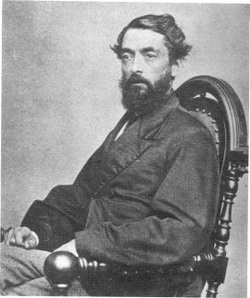 Edwin Drake died in 1880. He was buried in Bethlehem, Pennsylvania. Laura Drake lived until 1916. In 1901 Edwin Drake’s body was moved. It was taken from the cemetery in Bethlehem. It was buried again at Woodlawn Cemetery in Titusville. A monument was set up near Edwin’s grave. 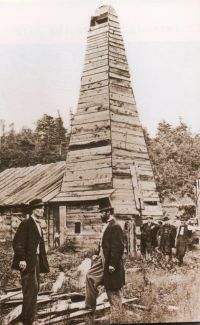 On August 22, 1914, a monument was set up on the well site. A bronze tablet was attached to a large boulder. The tablet explains about the well. In 1934 the Drake Well Museum and Memorial Park were opened. There is a replica there of the equipment that Edwin Drake used. Reading Level 3.4. 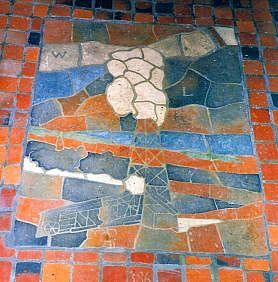 Image of Edwin Drake and image of the derrick used by permission from PHMC, Drake Well Museum, Titusville, Pa.Photographs of Mercer Tiles courtesy of Mrs. Maureen Book.